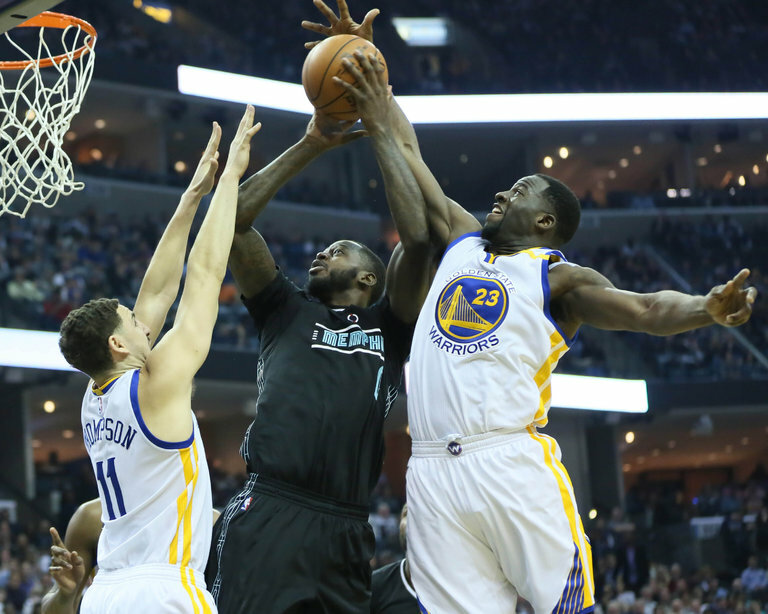 Draymond Green, right, and Klay Thompson trying to block JaMychal Green of the Grizzlies on Friday. MEMPHIS — Draymond Green’s triple-double was like no other in N.B.A. history. Green scored only 4 points but finished with 12 rebounds, 10 assists and 10 steals as the Golden State Warriors beat the Memphis Grizzlies, 122-107, on Friday night. With his all-around performance, Green became the first N.B.A. player to record a triple-double with fewer than 10 points. Klay Thompson had 36 points and Kevin Durant added 24, but it was Green’s performance that drew accolades from Warriors Coach Steve Kerr. Andre Iguodala had 22 and Stephen Curry finished with 18. Green’s 10 steals and five blocks headlined a Warriors defense that forced 19 turnovers and held Memphis to 39 percent shooting. A Brooklyn Family’s Long March Finally Reaches the N.B.A.